On London's busy Fleet Street, opposite Chancery Lane, is a stone arch through which anyone may step, and travel back in time. 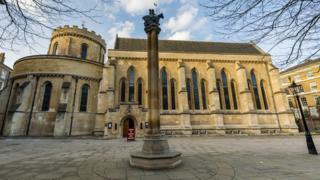 But Temple Church is not just an important architectural, historical and religious site. It is also London's first bank. 50 Things That Made the Modern Economy highlights the inventions, ideas and innovations that have helped create the economic world we live in. We don't actually know how the Templars made this system work and protected themselves against fraud. Was there a secret code verifying the document and the traveller's identity? The Templars were not the first organisation in the world to provide such a service. Several centuries earlier, Tang dynasty China used "feiquan" - flying money - a two-part document allowing merchants to deposit profits in a regional office, and reclaim their cash back in the capital. But that system was operated by the government. Templars were much closer to a private bank - albeit one owned by the Pope, allied to kings and princes across Europe, and run by a partnership of monks sworn to poverty. If you wanted to buy a nice island off the west coast of France - as King Henry III of England did in the 1200s with the island of Oleron, north-west of Bordeaux - the Templars could broker the deal. The Knights Templar were not Europe's bank forever, of course. The order lost its reason to exist after European Christians completely lost control of Jerusalem in 1244, and the Templars were eventually disbanded in 1312. If you had been at the great fair of Lyon in 1555, you could have seen the answer. Lyon's fair was the greatest market for international trade in all Europe. But to a new international elite of Europe's great merchant houses, his activities were perfectly legitimate. A merchant from Lyon who wanted to buy - say - Florentine wool could go to this banker and borrow something called a bill of exchange. This was a credit note, an IOU, but it was not denominated in the French livre or Florentine lira. Its value was expressed in the ecu de marc, a private currency used by this international network of bankers. And if the Lyonnaise merchant or his agents travelled to Florence, the bill of exchange from the banker in Lyon would be recognised by bankers in Florence, who would gladly exchange it for local currency. Through this network of bankers, a local merchant could not only exchange currencies but also translate his creditworthiness in Lyon into creditworthiness in Florence, a city where nobody had ever heard of him - a valuable service, worth paying for. Every few months, agents of this network of bankers would meet at the great fairs such as Lyon's, go through their books, net off all the credit notes against each other and settle any remaining debts. Our financial system today has a lot in common with this model. An Australian with a credit card can walk into a supermarket in Lyon and walk out with groceries. The supermarket checks with a French bank, which talks to an Australian bank, which approves the payment, happy that this woman is good for the money. But this web of banking services has always had a darker side to it. By turning personal obligations into internationally tradable debts, these medieval bankers were creating their own private money, outside the control of Europe's kings. Rich, and powerful, they had no need for the coins minted by the sovereign. That description rings true even today. International banks are locked together in a web of mutual obligations that defies easy understanding or simple control. They can use their international reach to try to sidestep taxes and regulations. And, since their debts to each other are a very real kind of private money, when the banks are fragile, the entire monetary system of the world also becomes vulnerable. We are still trying to figure out what to do with these banks. We cannot live without them, it seems, and yet we are not sure we want to live with them. Governments have long sought ways to hold them in check. Sometimes the approach has been laissez-faire, sometimes not. Few regulators have been quite as ardent as King Philip IV of France. He owed money to the Templars, and they refused to forgive his debts. So in 1307, on the site of what is now the Temple stop on the Paris Metro, Philip launched a raid on the Paris Temple - the first of a series of attacks across Europe. Templars were tortured and forced to confess any sin the Inquisition could imagine. The order was disbanded by the Pope. The London Temple was rented out to lawyers. And the last grandmaster of the Templars, Jacques de Molay, was brought to the centre of Paris and publicly burned to death. Should US banks do more to prevent a banking crisis?